Our contribution to the ice cream social: sliced poundcake and fresh fruit toppings. My freezer was stocked with sale-price butter, and ripe Georgia peaches cost only 78-cents/lb. Of course, that meant I had to peel them first! I puree 2 whole peaches (with skins) and lemon juice for a natural sauce. The old-fashioned pound cake recipe says 10 servings, but I seem to get at least 20 dense slices out of each one. Don't lose those crumbly bits from the poundcake bottom--they are the very best part! I save mine in a freezer bag for topping ice cream and puddings. Meredith you are a marvel. 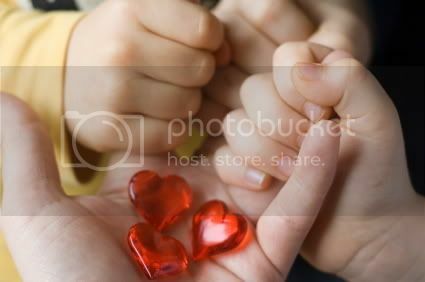 People have always learned from me and I am learning from a young lady the age of my daughter. Blessings to you this day and stay COOL and TAKE CARE OF YOURSELF!!! Meredith - That looks fabulous! That doesn't look very frugal, actually. why not just cube an angel food cake from Aldi instead? I think this fine-crumbed, Southern-style pound cake is SO different from what you can buy in the store, it's really worth the $ and effort. It costs about as much as a decent sour cream cake from the grocery, but I think it tastes so much better. I won't be baking much the rest of the fall, so I wanted to make something homemade while I could! Your suggestion of the angel food cake is a great alternative, though, if you were pressed for time. These are always some of the best desserts.....plain & simple. And I have to agree about your assessment of number of servings. I always get at least half again as many servings as the recipe states when I use my bundt pan. For this southern gal (ie - kill 'em with food) and dessert lover, I must say that those are the tiniest slices of pound cake I have ever seen. The presentation is attractive and I am sure I would be wise to just have a bite instead of a normal serving anyway. 1/20 of a cake and 1/100 of a pan of brownies is what I call portion control! And a guaranteed waist whittler! Plus, I realize there will be lots of other goodies to sample so I am sure you are smart to offer just tastes. I am trying to learn something here! The fruit looks so inviting--yum! Sounds way better than the karoke at our NNO. When should I come over? Wow...pound cake bottom crumbs for toppings? That's genius! So very yummy! Anon, everything was meant to be served with ice cream. I put full slices around the edge of the platter, half slices in the middle ring, and piled cubes of cake high in the middle. That way, everyone could take the size slice he or she wanted. I find that preslicing is the only way to go with large groups. No one wants to cut themselves a big piece while others are waiting in line behind them, but people can discreetly take 2 or 3 slices without anyone's being the wiser. If I were serving this in my home, I would just leave the cake on the plate and let people cut their own. Anyway, I'm sure everyone had plenty to eat--still had 1/4 platter of cake remaining after 60+ people ate. Meredith, I think you did a great job. Why stock up on sale-price butter if not for entertaining with pound cake?! 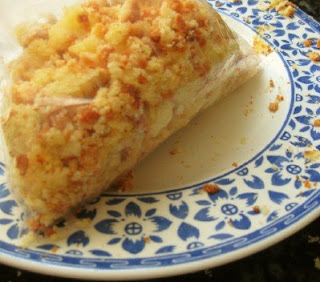 What a perfect idea for using the poundcake crumbs. Oh, the sadness of the ones that have gone in the trash! Great idea for saucing the fresh peaches! I made a yogurt/ricotta pie for a block party tonight and wanted to put fresh peaches on it. Our "cheap" peaches are $1.50 a pound here in PA. I'm going to stock up next time butter goes on sale so I can make pound cake too - you are full of good ideas! Anon #1, hunny, you keep your stale angel food, I'm going to meredith's house for dessert thankyouverymuch. Life is too short for ersatz dessert. (look that up). Latrice, keep those comments comin, they kill me! Oh, that pound cake looks great! 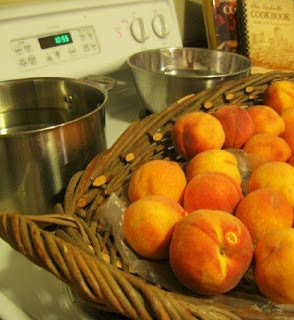 We are enjoying our fresh peaches this year too & I saved some for the freezer for later. YUMMY! What's up with the not-so-nice anonymous commenter? You, anon #1, have nothing better to do than criticize someone's choices? If your life were laid out for the whole world to comment on, I daresay that someone might find fault with you too. Chill out, it's just dessert! I'm going to have to try making poundcake myself...mmmm with boysenberries! That looks wonderful :) I had to comment to ask if you could post the recipe. 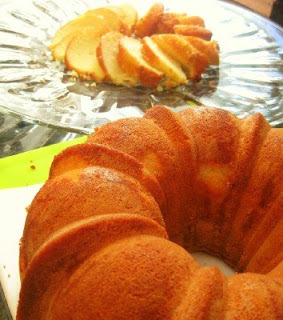 I adore pound cake but have never found a good recipe since nobody in my family cooks/bakes. I love your blog for both the thriftiness of your spending and your hospitality. This post is such a delight. Things like this are just absolutely rocket science for me, so it's just amazing that you can whip up these amazing treats AND do it frugally. Thank you for sharing! Well, that is a great contribution! Oh so yummy! That homemade pound cake will put any store bought cake to shame. It's the simplicity of the pound cake when you look at it. Then well... then you see the topping for myself any topping that you can spoon the amount you want, yet being a little conservative to leave some for others is so inviting! I just want to hide under that table and savor every morsel and praise god that there is such a dessert. You did great a great job! MEREDITH! You have gone and done it again! I just learned a new trick. Bagging up the crumbs!? FANTASTIC!! I am going to do this next time. Now... any suggestions on how to keep Hubs from scooping them all up with a fork before I return with a baggie? haha. Ha ha ha! Just to be clear, I bagged the crumbs from the cutting board--not someone's plate! That would truly earn me notoriety in the frugal hall of fame, huh? I have tried (and enjoyed) the all-butter poundcake from the Ultimate Southern Living Cookbook, but truly I think this old-fashioned version with Crisco has a finer crumb and moister taste. This recipe is from the vintage Nashville Cookbook, published by home ec teachers and nutritionists across the region. Grease and flour 10-in tube pan (or use Baker's Joy spray). Cream butter, Crisco, vanilla, and sugar, adding small amts of sugar at a time. Add eggs, one at time. Sift flour with baking powder and salt. Add to creamed butter alternately with milk, beginning and ending with flour. Pour into pan. Bake 1 hour or until cake tester comes out dry. I let mine sit 10 minutes on the counter before unmolding. Greasing with Crisco and flour gives a crunchier crust, but Baker's Joy spray is more reliable for perfect crusts. Yum! That looks wonderful. 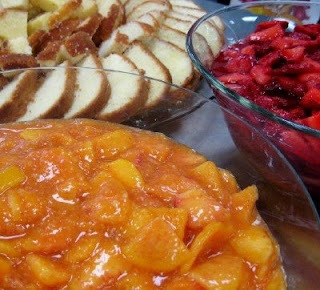 Nothing better than a good old fashioned pound cake and fresh fruit. Pound cake is my favorite all around dessert. Yes, I love ice cream and chocolate...oh yes I do. But, you just can't go wrong with a good pound cake. At one time, our local grocery store sold a pound cake...Mrs. Daisy's 5 Flavor Pound Cake....it was soooooooo good, but a wee bit pricey (really, maybe more than a wee bit because they stopped offering it.). It was as close to a homemade pound cake as you could buy. I'm learning something new from you everyday. Never in my life have I seen pound cake with Crisco in it! Always something new here, thanks for sharing that recipe and the detail about the crust. By the way since Meredith uses Crisco in her pound cake am I the only one who uses Crisco in my apple pie crust? This crust I have made since my grandmom taught me how to make pie crust. I believe that the Crisco is what gives the crust it's flakiness. I would be old school and use lard but where to get that around here. Will everyone hate me for using 1/2cup Crisco? It's almost certainly LESS than if I bought a storebought cake. I know my grocery's sour cream pound cake uses shortening instead of butter. I don't fry at all and never really bake just for us, so I have a can in the fridge just for old family recipes for special occasions. But, I have a question - perhaps a dumb question but I just need to know... if you're going to puree the peaches with skins, why do you have to peel them first? Oh--I peel the bulk of the peaches. But cut peaches turn brown, so you need to add lemon juice to the slices. Instead of putting lemon juice and a lot of sugar for a sauce, I take 2 peaches and puree them with skins and lemon juice. I think this makes makes the sauce thicker and stronger in flavor than the flesh alone--and the peeled peach slices do not brown. Oh Meredith, I wasn't chastising you for using Crisco! It was just a novel idea to me, and I love the science of what changes you observed in the product. erika and renee: Yes about Crisco and pie! Do you have a favorite Crisco recipe? I am currently teaching myself to make a consistently good, go-to pie crust, as my crust results have never been worth more than a yawn. (Thank goodness for fillings and crumb tops!). Last night's trial was from Country Living ('Katie's Buttery Crust') but it was more of a pate brisee, had 2 sticks butter. Anna's crust, using vinegar, from Pleasantviewschoolhouse.blogspot.com, is VERY tasty, though a bit sticky. Crisco pound cake is so good! It has a fabulous crunchy crust. It also keeps better if you're making it in advance. I once mailed one to Texas (for my mother's birthday - it's her favorite) and it got raves. Looks delicious and thanks for sharing the recipe and serving techniques. I'm relieved to see the crisco because it makes it more likely that my non-dairy substitute will work. And I love the idea of a ice cream social potluck as a cost-effective way to entertain a large group. I made this cake and it was amazing! I mean really, really good. We didn't have peaches but I did have a couple plums and that was delicious too. I think I'm going to have to hide the leftovers in the freezer! Deb, my favorite pie crust is a larger version of the recipe in my Better Homes & Gardens cookbook: 3 1/4 cups flour, 3/4 teaspoon salt, 1 c Crisco, 9-11 teaspoons water. The standard-size recipe never gave me enough to work with to make a really pretty crust; I use any leftovers to make little tarts. Getting the pound cake out of the pan is the trickiest part. I used to grease meticulously with Crisco and then flour. Now I use either Baker's Joy or Crisco with Flour spray--they seem to coat better. Whatever spray you use, it MUST be one with flour added to it. Greasing alone is not enough. Also the pan can make a difference. I have 3 yard sale Bundt pans, all made by Nordic Ware, but each one has a slightly different baking time and a varying degree of releasing the crust. My oldest, darkest pan works best.